This is a sponsored post on behalf of Kellogg’s® Rice Krispies®. As always, all thoughts, opinions, and ideas are entirely my own. Thanks for your support! 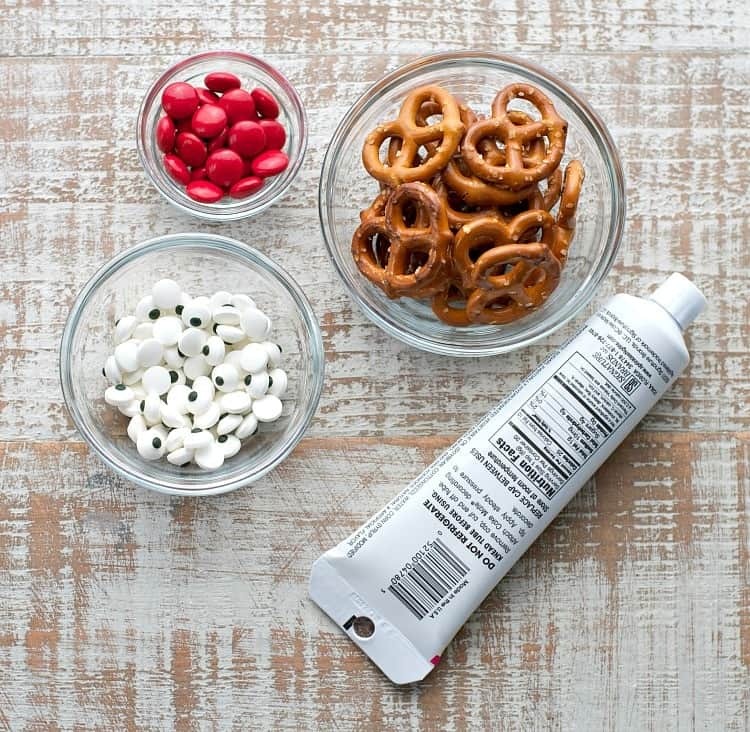 There’s no better time than the holidays to get in the kitchen with your little ones and whip up something sweet! 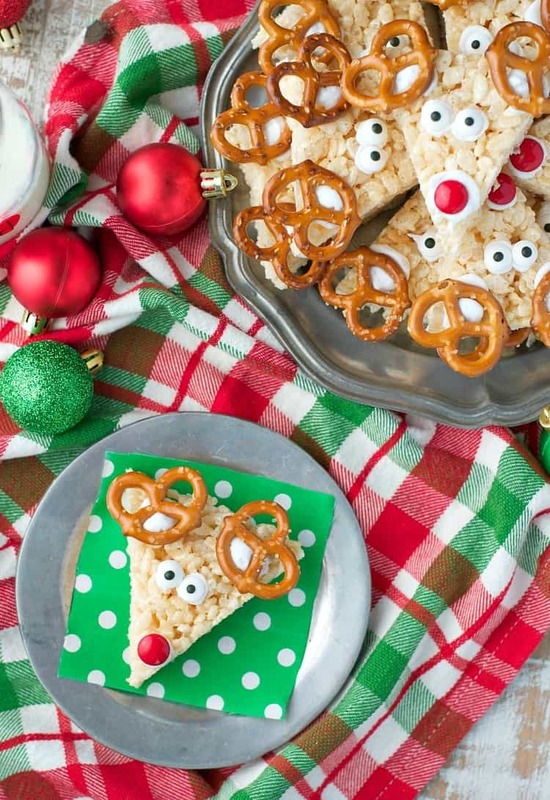 These Rudolph Rice Krispies® Treats are an easy Christmas dessert that your children can help prepare, making the bars a perfect addition to your festive holiday platters. Hey, friends! I’ve got Christmas music on the radio in the background, a mug of Gingerbread Spice tea on my desk, and an evergreen candle burning nearby. That can only mean one thing — ’tis the season! While it’s the happiest time of the year, this is also the busiest time of the year! Between family gatherings, school performances, class parties, Christmas shopping, and holiday parties, I know that I’m not the only one juggling many balls in the air. I’m not complaining about all of the excitement, but I do know that I need to be prepared with a game plan to tackle this season so that it doesn’t leave me exhausted, stressed out, and unable to enjoy the fun. 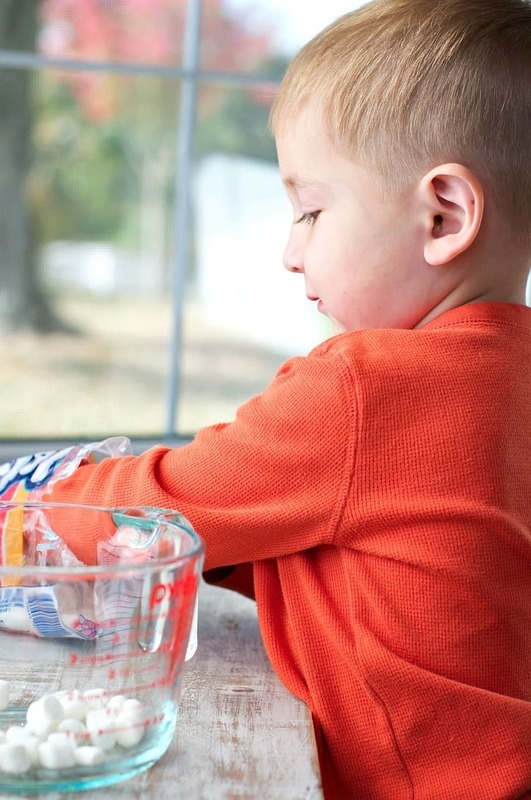 Spencer loves to help me with just about any kitchen task — especially when it involves sweets — so I gave him the task of measuring (and eating) the marshmallows. I handled anything involving the stovetop! 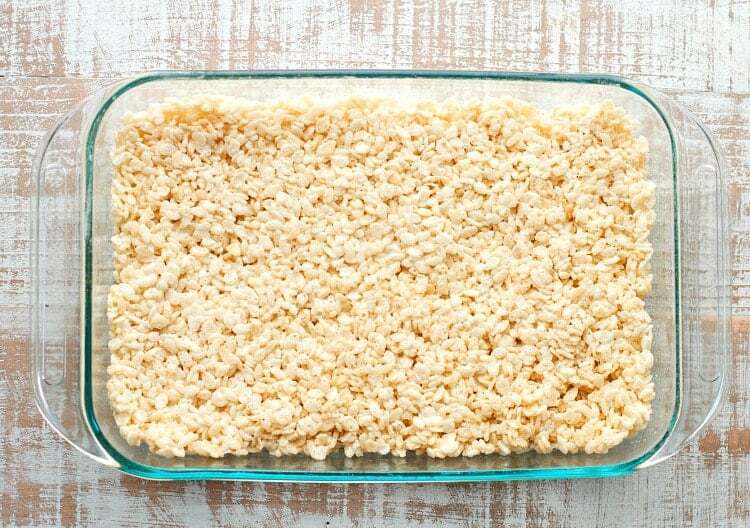 After melting the butter and marshmallows, I added the cereal and pressed the mixture into a prepared dish. 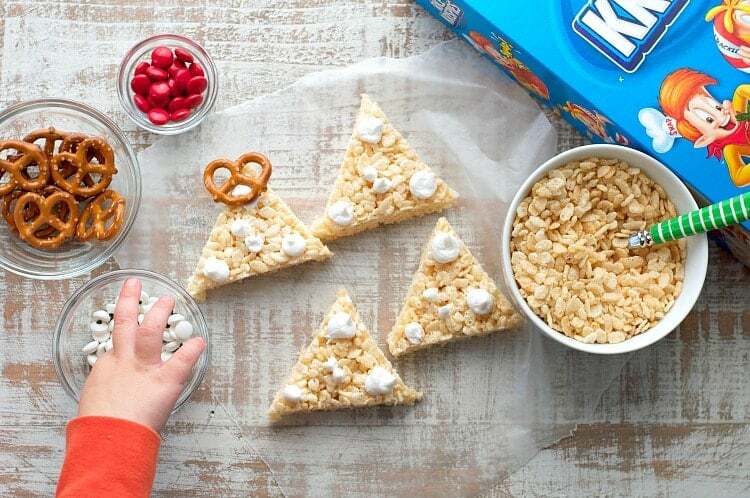 Once the Kellogg’s® Rice Krispies® Treats were cool, it was time to decorate! I cut the bars into 16 triangles, and then finished them off with our Rudolph toppings: miniature pretzels, round red chocolates, candy eyes, and a tube of frosting to act as the glue. Spencer wanted to help (again), so I squeezed the frosting in the correct spots and then I let him finish the faces. Notice the bowl of cereal on the side, which he just had to have for snack as soon as he saw the box! 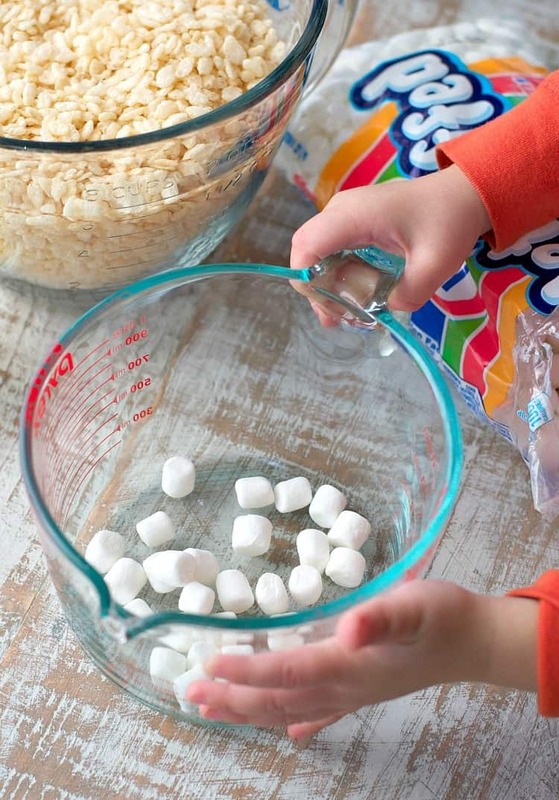 You’ve got to love a dessert “hack” that’s so easy even a toddler can do it! 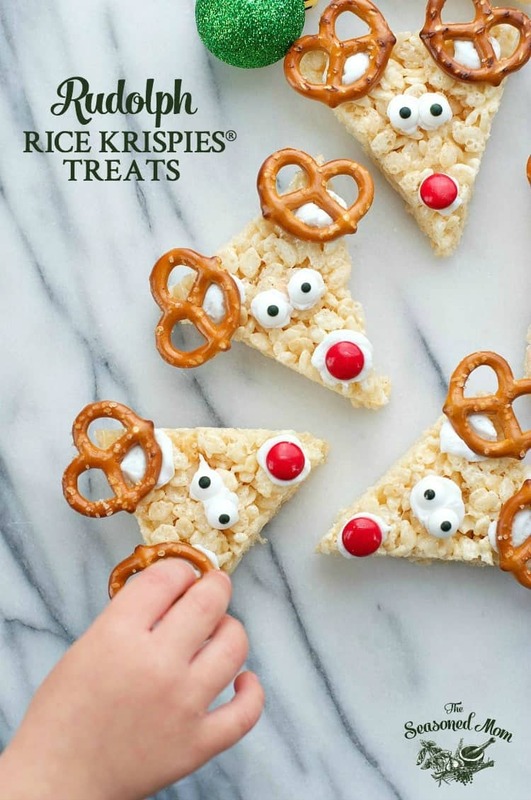 These adorable Rudolph Rice Krispies® Treats are sure to make little mouths happy! I foresee many more batches of these goodies in my near future. They’re much faster than baking cookies or a cake, they’re easy to transport, and my kids can’t get enough. The older boys made a big dent in our stash as soon as they walked in the door from school, of course. Smiles all around, and such a fun way to celebrate the season! 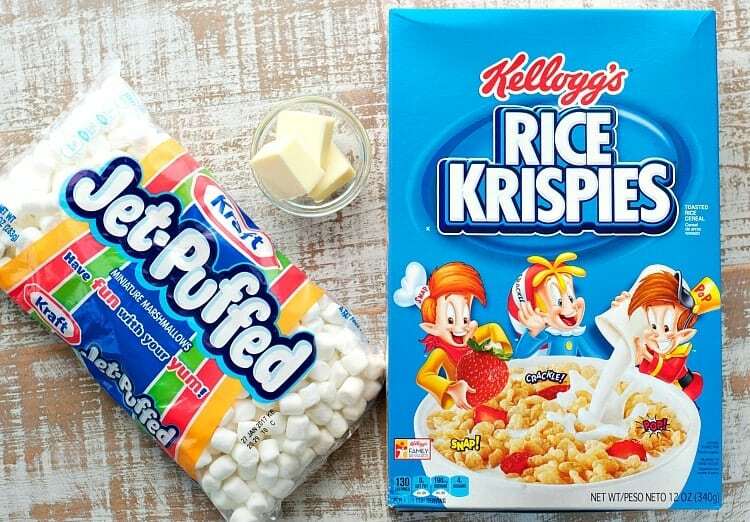 If you’re looking for even more great Kellogg’s® Rice Krispies® Treats hacks, be sure to check out the Kellogg’s® Rice Krispies® website — there are plenty of other fun ideas! 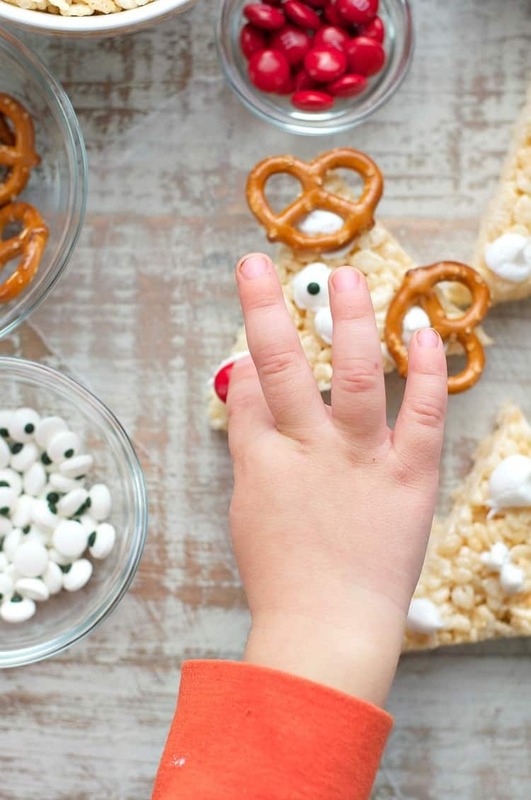 Plus, during the holiday season, for every photo of a Kellogg’s® Rice Krispies® Treat shared using #Treats4Toys, Kellogg’s® Rice Krispies® will donate a gift to Toys for Tots to help give a little joy to a child in need. Now that’s the spirit. I hope that you’ll join us by participating in this awesome campaign! Using buttered spatula, sprayed hands, or wax paper evenly press mixture into 13 x 9 x 2-inch pan coated with cooking spray. Cool. Cut into 16 triangles. 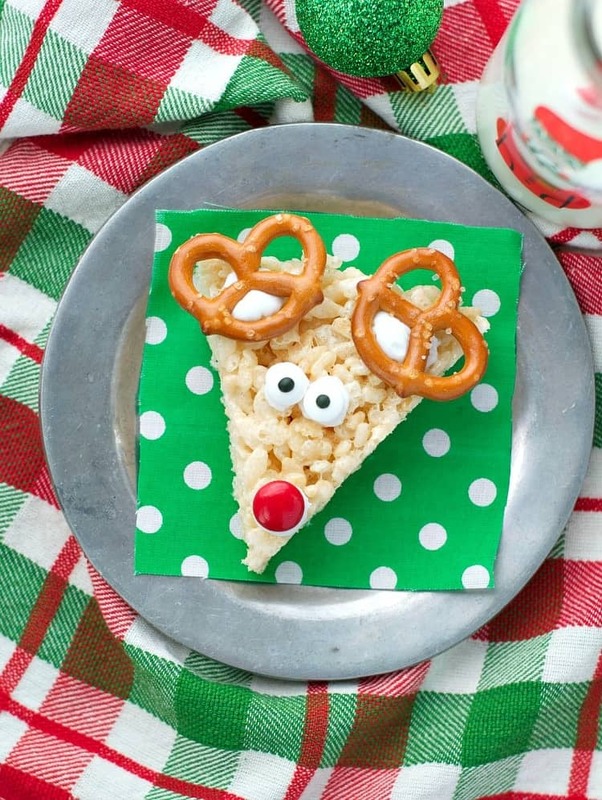 Using frosting as glue, add two pretzels (for antlers), two eyes, and one red nose to each triangle. These are best if served the same day, but you can also store them in an airtight container for a couple of days. I’m so excited that it’s finally the holiday season! I’ve been listening to Christmas music for the past few weeks, and that gingerbread tea sounds delicious! These treats are just the cutest, Blair! 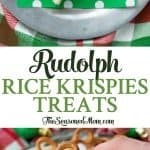 What a fun treat for the holidays! Looks like your boys LOVED them! I love seeing kids in the kitchen, Blair! It’s so important that our young people develop those skills at a young age. These look so yummy and fun! I agree, Robyn! 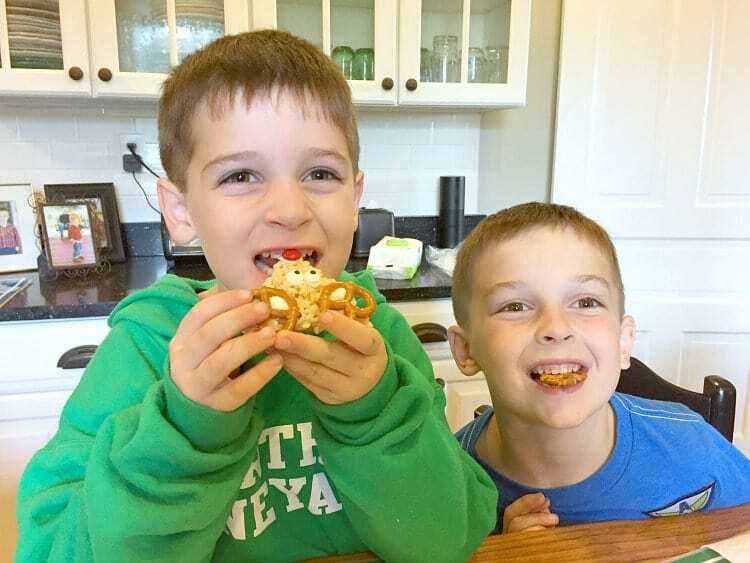 I love to get my boys in the kitchen, but not surprisingly, they are much more willing when it involves something sweet! These are do cute! Where do you find candy eyes?! Love this idea for the holidays! I know those would be devoured in no time. Exactly! Thanks so much, Kim! These are SO cute! 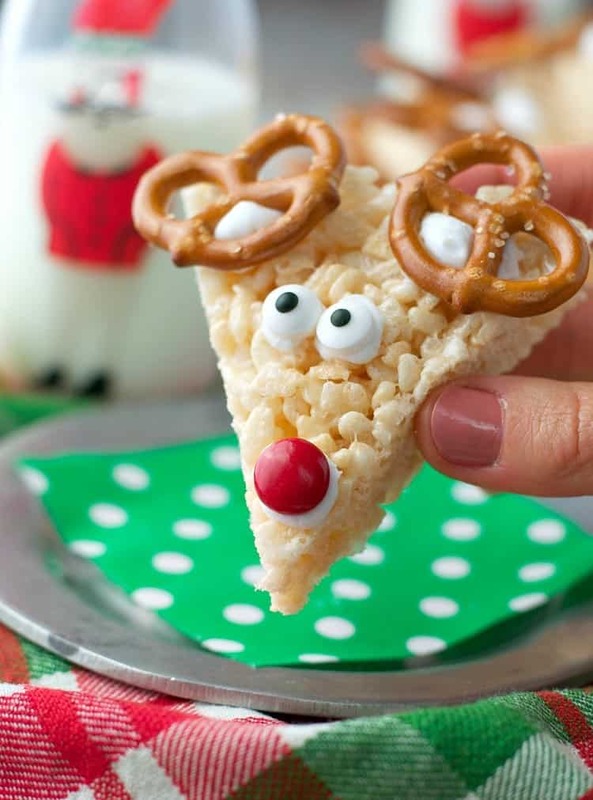 And would be the perfect holiday party treat for kids!